Where, Oh Where Does This Cause Go? As a ThinkReliability instructor and facilitator, very often I get the questions, "Where does this cause go?" or similarly, "Where does this cause fit in?" Then begins a discussion to find the most accurate location on a Cause Map. Please notice that I did not use the phrase, "the right location.” You are striving for an accurate and clear map of the incident. As this is taken directly from the Outline of the problem, we are starting on solid ground, and we can confidently state that the potential high impact event (aka a near miss) caused an Impact to Safety. When we read this pair, the logic still works – cutting on the wrong side of a device could lead to a high impact event. When we apply the logic to this pair, we can see that the relationship does not make sense. Removing the isolation valve does not cause the cut to be on the wrong side of the valve. It is more accurate the other way around. Now we have an accurate starting picture of this part of the Cause Map. The technique can then be applied as a quality check to assist with the overall construction of the Cause Map. Sometimes the logic we have discussed above can work both ways! When that occurs, it is a clear sign of the need to understand the exact meaning behind the cause. Most often you will find that there are underlying differences implied in each position that are not always clear at first. Detail will be your friend. I encourage you to check out Ely Wilson’s blog on the Chicken and the Egg. 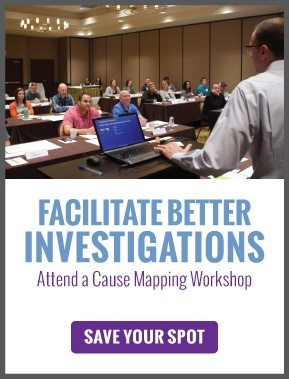 Ely speaks to adding detail to your Cause Map.